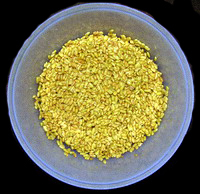 Clean and wash the fenugreek and soak in water for overnight. Next day again wash and strain the water. Cool dry for 30 minutes. Peel the skin of mango and grate. Add turmeric powder, salt and grated mango to the soaked fenugreek. Let it remain for a week or 10 days in a jar with airtight lid. Daily toss once. After this check if the contents are tasty and soft. 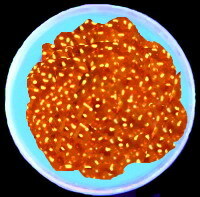 Take oil in a kaDAi and add mustard seeds. When they splutter add the soaked fenugreek and red chilli powder. Sauté well for 5 minutes. Put off fire, mix asafoetida and store in the jar with the lid tightly in a cool place. Another way is to treat the fenugreek soaked for a week or ten days as stock and add red chilli powder. Mix well and allow to remain. Take out a little from time to time when needed and season it with mustard seeds and add asafoetida after it is warm. dAls and red chillies. Sauté till the dAls become golden brown in colour with a fine aroma. Cut green chillies and add just a few seconds before removing this from fire and sauté. Remove from fire and when cool, grind these along with tamarind, asafoetida and salt into coarse powder. Now add the coriander leaves and grind coarsely. Remove. Store in an airtight jar and refrigerate. 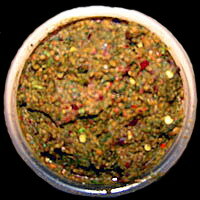 If you find it difficult to grind, you can add 1or 2 tbs of water. Never use your hand directly if you want to prolong shelf life. Goes well with plain rice and poricca kUTTu as well as curd rice. Also you can mix a little oil and use it as a side dish for tOSai. In south India, you get a special type of ginger which smells like baby mango but does not taste like ginger though looks like that. It can be eaten raw though the taste is somewhat astringent. It is nice to pickle this. The ginger should be tender. 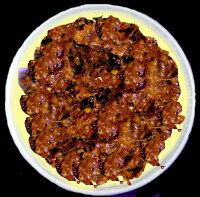 The pickle can be prepared in two ways either with green chillies or red chilli powder. Wash and clean the ginger and wipe dry. After 5 minutes of cooling under the fan, cut into very small pieces. Extract lemon juice over a little salt and remove the seeds. Take the cut pieces in a jar and add turmeric powder, salt and lemon juice. Cut the green chillies finely and add. Mix well. Close the jar with a tight lid and allow this to remain for a week. Toss once daily. After a week season it with mustard seeds and store in a cool place. Instead of green chillies you can add red chilli powder and follow the rest of the procedure. You can adjust chillies or chilli powder to taste. The ginger should be fresh and tender. Wash and clean to remove mud and other impurities. Allow cool drying for 10 minutes. Scrap gently with a blunt knife or spoon just to remove the skin. Cut into small pieces. Take a little oil in a KaDAi and add the ginger pieces along with the red chillies. Sauté well for 5 minutes. Remove from fire and when cool, grind along with tamarind, salt, asafoetida and jaggery into a paste with a very little water. Remove. Take oil in the kaDAi and add mustard seeds. When they splutter, add the paste, turmeric powder and sauté well till it leaves the side. Remove from fire and when warm mix pre dry roasted fenugreek powder. Store in an airtight jar after cooled. Can be used with plain rice as well as curd rice. 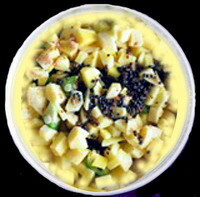 Acts as a side dish with tOSai. This entry was posted on February 2, 2012 at 1:45 pm and is filed under Indian Pickles with tags asafoetida, Coriander leaves pickle, fenugreek, fenugreek pickle, ginger pickle, Indian pickles, inji tokku, Kottamalli tokku, mangai inji, mango ginger pickle, mustard seed powder, red chilli powder, red chillies, refined oil, table salt, tokku, turmeric powder, urugai, vendayam pickle. You can follow any responses to this entry through the RSS 2.0 feed. Both comments and pings are currently closed.